Visitors to the Toronto Garlic Festival take a 360-degree virtual reality tour of garlic grower Simon the Farmer’s farm. The festival has created the 360-degree live action video of Simon working in his fields during the summer garlic harvest. 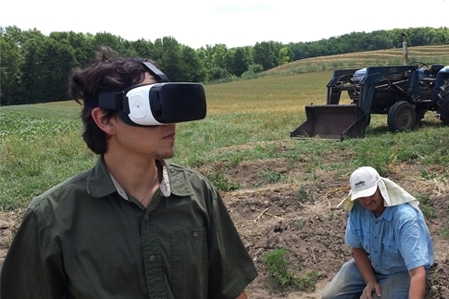 This virtual reality tour invites visitors to the Toronto Garlic Festival to “witness” a real garlic harvest in the hot sun, bringing festival goers closer to the garlic growing process via a pair of virtual reality goggles. The “tour” takes about 3 minutes and runs all day during the festival. Simon will be selling his garlic at the festival. Virtual reality is a computer technology that allows users to visually and/or physically interact in a replicated environment using panoramic views or video simulation. The video was created by Capture Scratch for Toronto Garlic Festival. Capture Scratch is a film and media production company that offers services including lighting, camera, direction, and editing, whose background in technology research and development allows them to experiment with screen based technologies.